The ideal resource for supplementing classroom presentations, the Study Guide includes "Chapter in a Nutshell" descriptions, key concepts review, learning objectives fill-in-the-blank questions, step-by-step interpretation of graph boxes, multiple-choice and true-false questions, and crossword puzzles to help students reinforce concepts and prepare for class. 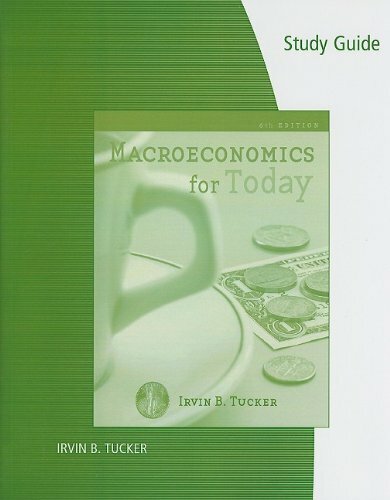 Available at academic.cengage.com/economics/tucker. Dr. Irvin B. Tucker has more than 30 years of experience teaching introductory economics at the University of North Carolina Charlotte. He earned his BS in economics at North Carolina State University and his MA and PhD in economics from the University of South Carolina. Dr. Tucker is the former director of the Center for Economic Education at the University of North Carolina at Charlotte and a longtime member of the National Council on Economic Education. Dr. Tucker is recognized for his ability to relate basic principles to economic issues and public policy. His work has received national recognition with awards from the Meritorious Levy Award for Excellence in Private Enterprise Education, the Federation of Independent Business Award for Postsecondary Educator of the Year in Entrepreneurship and Economic Education, and the Freedom Foundation's George Washington Medal for Excellence in Economic Education. In addition, Dr. Tucker's research has been published in numerous professional journal articles on a wide range of topics, including industrial organization, entrepreneurship, and economics of education.